Condo Culture | Favourite Features from your Favourite Website! Favourite Features from your Favourite Website! Happy Friday Everyone. Our web team has been very busy over the past few weeks and we’re excited to announce that searching for a condo online just became a whole lot easier. In our humble beginnings when we first launched the CondoCulture.ca website, it was pretty basic. Our team of 3 at the time, Jeff, Scott and Tim, pulled together all of the information we had on all of the most popular condos in town, Jeff learned how to program the website and off we went. It wasn’t pretty but it showed some great pictures of the buildings to give you a good feel for what to expect and gave you all of you the basic info you needed to know about each of the area’s top condo and loft buildings. Thankfully, we’ve grown and now have some very talented people (sorry Jeff) behind the scenes that work on our website all day long and sometimes late into the night making sure everything looks great and runs crisp and smooth. Following the launch of our new website earlier this earlier this year, we’ve been busy making the site better and better for you. 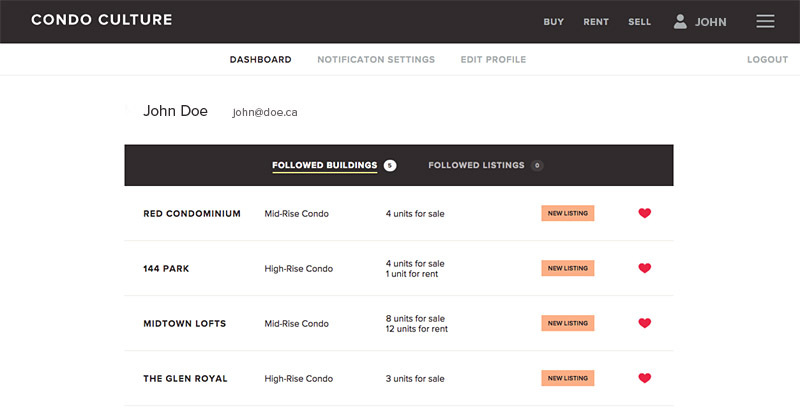 This week we’re happy to announce some really cool features that will allow you to search for a condo and narrow in on your favourite buildings and units with ease. One of the most significant changes to the website is you can now follow your favourite buildings or receive updates on any condo units available in the market and receive regular weekly updates on price changes, new availability and more. If you haven’t already done so, simply click ‘LOGIN’ in the top right corner of our homepage and click ‘Create an Account’. Or as you’re searching the site simply click the cute little red heart beside each building or listing. An option will pop up to allow you to either login or create an account to view your favourites. Condo obsessed or want the latest news? Don’t worry - we’ve got you covered. Daily updates are now available too! Receive new listings in any building you’re following as soon as they hit the market. This is great as it allows you to pick your favourite buildings and get updates on any new units in that building as soon as they come available. Whether you’re hot on the search for specific buildings or live in a building and just want to stay up-to-date with values, you’ll love this new feature. Price or status changes of any favourite units you’re following. This is great as it allows to pick your favourite units throughout the area and follow any movement in price or status when they are sold or removed from the market. We’re all deal hunters at heart so when you see that listing drop in price, reach out to us. It may signal a good time to make an offer or take a second look. Status changes in a building. See a brand new development on our website that you love but isn’t selling units yet and want to be kept in the loop on the latest activity? We’ve labelled these buildings “Coming Soon”. Follow these buildings to receive updates and be the first to know when units are coming available for sale. This is a great feature for all but particularly helpful for you serial condo investor out there who looking to stay in the loop with the latest pre-construction investment opportunities. We’d love to get your feedback on other things we can do to improve the website and make your search for a condo easier and easier. If there are other things you think we could be doing online or otherwise to improve, reach out to us. We’d love to hear from you!